Alyaksandr Lukashenka said on Tuesday that the ousted president of Kygyzstan, Kurmanbek Bakiyev, had been staying in Minsk since early Monday morning. According to the Belarusian leader, on the night between Sunday and Monday, he directed the appropriate agencies to arrange for Mr. Bakiyev to be transported to Minsk. “He asked for that more than once,” Mr. Lukashenka told the Belarusian parliament, noting that Mr. Bakiyev arrived in Minsk in the early hours of Monday. According to Mr. Lukashenka, a medical commission has been appointed to examine the health of Mr. Bakiyev and his family and has already made a preliminary examination. “If he [Bakiyev] is in need of not only rehabilitation but also medical help, we’ll certainly provide it,” Mr. Lukashenka said. Mr. Bakiyev fled Kyrgyzstan last week after an uprising against his five-year rule left 83 people dead. He took refuge in neighboring Kazakhstan and then left Kazakhstan for a destination that had not been clear, after the Belarusian leader had said that Mr. Bakiyev would be welcome in his country. Kyrgyzstan’s interim government expects Belarus to ensure that ousted President Kurmanbek Bakiyev is “safe and secure until his trial,” Russia’s RIA Novosti reported on Tuesday. The interim government views Belarus as a “deeply friendly state,” Edil Baisalov, chief of staff to former Foreign Minister Rosa Otunbayeva who leads the government, told the news agency. “It is the personal business of Alyaksandr Ryhoravich and his right,” Mr. Baisalov commented on the Belarusian leader’s move to invite Mr. Bakiyev to Belarus. “This game is led by the Kyrgyz interim government as well as by Russia and Kazakhstan. I believe the United States have their hands in this also,” the Belarusian leader said. Alexander Lukashenko added: “I hope I will have a chance to discuss all these issues with the President of Kyrgyzstan personally and see whether I am right or not”. The President noted that “my colleagues in Kazakhstan and Russia would not want the ousted President of Kyrgyzstan to stay on their territory as a criminal case has been opened against him”. “You know, the most shameful thing is that the current interim government of Kyrgyzstan seems to have waited for Bakiyev to leave Kazakhstan to put him on the international wanted list,” Alexander Lukashenko said. “We are not hiding him here, we are recieving him as the most distinguished guest, as my colleague, as the President of Kyrgyzstan,” the Belarusian leader said. Alexander Lukashenko reiterated that if “the President of Kyrgyzstan needs support and help in this very difficult moment for his family, he will be provided it in Belarus”. “We are ready to receive him here,” he said. The President noted that it was his personal decision. “As the head of state I have the right for it. I believe that betrayal is the most disgraceful thing in the world,” Alexander Lukashenko said. The Belarusian leader also added that if Kurmanbek Bakiyev would like to hold a press conference in Minsk, “he will be able to do it freely”. “We will see then which country is more democratic: Belarus or some other state. I think he will say a lot,” the President said. 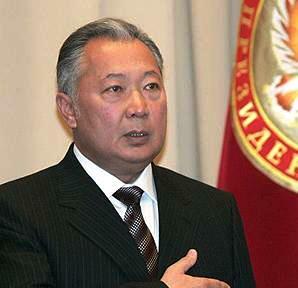 President of Belarus Alexander Lukashenko still believes that Kurmanbek Bakiyev is the legal president of Kyrgyzstan. “For me it is Kurmanbek Bakiyev who is the president of the country,” stressed Alexander Lukashenko. The Belarus President added that the signatures under the resignation that mass media are demonstrating these days should not be trusted. “Even if he declared he would quit, you should understand the circumstances it happened. When he has small kids, the family to take care of, when he is blocked in the mountains and a civil war may break out. It is in this situation, in complete solitude that man happened to be. What decisions could he have made in these circumstances?” wondered the President. The Belarusian head of state reiterated: “For me he is the president of a friendly country. I am sure that after 2-3 years Kyrgyzstan would have gotten back on its feet. The thing is it is a strategic territory which is now being torn apart by those who claim they have ‘vital interests’ there. The question is: what about interests of the Kyrgyz nation? It is all tied together and it is the core reason why the nation is poor. Kyrgyzstan is a poor country. They are poor people who are ready to work for food. Instead of fighting nearby, in Afghanistan, spending billions of dollars and killing people, the Americans might have helped the Kyrgyz nation, might have restored the country”. “There are a lot of obvious glaring issues but everyone pretends they don’t see them. Then information attacks begin. It is total nonsense,” stated the Belarus President. Commenting on the statements made by a vice premier of Kyrgyzstan’s interim government that the country willing to host Kurmanbek Bakiyev will have problems with Bishkek, Alexander Lukashenko said: “I would like to ask three rhetorical questions. First, what serious problems we can run into? Second, would Belarus not be able to survive these problems? Would we fold up tomorrow if we ran into problems with Kyrgyzstan? Third, if Kurmanbek Bakiyev was in Belarus today, the Kyrgyz interim government would benefit from it. Because they would be free to act the way they want if there was no president in Kyrgyzstan”. The Belarus President remarked that what he said before is now true. “The entire south of Kyrgyzstan is ablaze. People take over administrative buildings in Jalal-Abad, Osh. People protect the brother of the overturned president and other relatives of his,” stated Alexander Lukashenko. 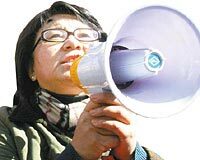 “I would like to address the Kyrgyz nation: don’t let your president be betrayed. It would be a most severe mistake”. The Belarusian head of state underlined: “Only his nation can hold a president accountable. No gangs, no groups, no opposition can, but the nation”. “A real way out of the present situation, if you are as democratic as you say, would be declaring pre-term presidential elections and, for that matter, parliamentary elections. And letting everyone willing to participate in the elections, including Kurmanbek Bakiyev,” Alexander Lukashenko is convinced. The year 2010 should lay the foundation for making a breakthrough in the development of Belarus, a new stage in creating a strong and prosperous state, President of Belarus Alexander Lukashenko said in his annual State of the Nation Address on 20 April, BelTA has learnt. The focal point of the address is “The dynamic breakthrough in the development of the country – a way to a new quality of life”. “The year 2010 is literally a key milestone in shaping the strategy of Belarus’ further development. First, the year marks the completion of a number of state programs, first of all, the program of social and economic development of Belarus for 2006-2010,” the President said. In his words, despite some objective difficulties facing the national economy, the state does not abandon the commitments taken on five years ago at the Third All-Belarus People’s Assembly. “Second, in 2010 we should completely overcome the consequences of the crisis that affected our economy and at a minimum to restore the pre-crisis economic growth rate,” the Belarusian leader underlined. “Our well-being, social and economic progress hinge on the efficiency and quality of our work in 2010,” he added. Belarus should emerge from the crisis more advanced and ready for a tough competition in the post-crisis conditions, Belarusian head of state Alexander Lukashenko said . The President stressed that quality remains the key point in all areas of the activity. It is the quality of goods and services, management and, what is most important, the quality of the people’s life. “The issues concerning quality have always been among the country’s priorities. They have become even more urgent as we are emerging from the financial and economic crisis,” Alexander Lukashenko said. “There is no chance to return to the old positions as new consumer requirements are laid down. On a global scale the privilege will be given to that economy that reaches the highest rates in labor productivity, the quality of products and the prime cost reduction,” the Belarusian leader noted. According to the head of state, Belarus has achieved a lot over the past years. “But it is impossible to move further by inertia, without additional efforts, without setting forth new promising and even ambitious goals,” the Belarusian leader said. Alexander Lukashenko drew attention to the fact that the economic principles are reconsidered in today’s world. Those economies that never stop moving forward and adopt the best practices become the most successful. “In this respect we are in a desperate need of a qualitative breakthrough in the national economy,” the President remarked. Alexander Lukashenko also outlined new strategies to secure a quality breakthrough in the economy development. “First comes a new technological strategy. It envisages structural reforms in the economy to promote industries manufacturing high value added products; creation of high-tech production facilities to offer brand new goods and services; introduction of market incentives to galvanize innovative activity of all economic entities,” the head of state said. Another key strategy deals with business activity. “Its major principle is competition instead of monopolies. I believe it is time to adopt Directive No. 4 to further liberalize the economy and encourage business initiatives,” the Belarusian President said. These strategies are followed by a transit strategy that envisages the broadening of transport, communications and financial corridors. “This should become a major instrument to make a quality economic breakthrough and help Belarus occupy its niche in the international division of labor using its geographic advantages,” he stated. An energy strategy envisages a more active use of renewable energy, creation of new cutting-edge energy capacities and diversification of traditional energy sources. The economic breakthrough is impossible without an IT development strategy aimed to make electronic services available to people and businesses. “These strategic guidelines will help Belarus advance even further and work much more efficiently than earlier. They underpin the focus on quality in our national policy and the decision to declare the year 2010 the Year of Quality,” the President said. The head of state emphasized the need to cultivate the general culture of quality in the country, to promote a high quality of life, labor and education. The ultimate goal is to create a modern competitive economy, the state, and the nation in general. “We should reach the European level of life in the near future,” the President said. The need to stop being dependent on monopolies, primarily from Russia, forces Belarus to seek and secure its foothold on new markets. President of Belarus Alexander Lukashenko made the relevant statement in his address to the Belarusian nation and the parliament on 20 April, BelTA has learned. “It is our vital need to avoid dependence and dictate, primarily that of Russian monopolies. To avoid being kicked about and blamed that we live at someone else’s expense,” said the head of state. “We are forced to seek other markets and we have found them, not only in Venezuela,” he added. As an example Alexander Lukashenko recalled the sugar dispute: “Who was behind it? The tycoons that deal with this sweet matter in Russia. They came to Putin and said that [Belarus] sets dumping prices, subsidizes, supplies cheap sugar to the Russian market, destroying our economy. I was trying to prove my point to the president and the prime minister of Russia: you make about 50% of the sugar you need in Russia. For instance you import 1 million tonnes and we supply 150,000 tonnes. Why do you reject Belarusian sugar? You still buy the rest! You say that we set dumping prices. Good. Let’s say that the income we gain with these low prices is sufficient for us. Name the body we should sell this cheap sugar to. Take it away and sell to the Russian people at a tripled price in order to keep the prices high. They couldn’t do it”. The President also reminded that due to the blocked supplies of Belarusian sugar the sugar price in Russia went up several times. “What kind of politics is that? Why did anyone have to make sugar in Russia that expensive? People have to buy it! So this is the kind of politics I am talking about. We were ousted, they got what they deserved,” said the Belarusian head of state. “Then we are building the Customs Union. Customs duties have been imposed on oil, making it almost twice as expensive. Why do you do it? Is it your politics? Well, we have to comply because it is their commodity,” said the President. Alexander Lukashenko remarked that in this situation Belarus had to seek oil in other countries and today it successfully and profitably extracts oil in Venezuela and has started extracting oil in Iran. “You are our closest allies. You and we built the oil pipelines together and explored gas deposits together. Why do you push us away? Why do you force us to seek our happiness, this hydrocarbon raw stock at the back of beyond? If it is transported from Venezuela, a tanker has been on its way for two weeks now. But Russia is nearby! Let’s us extract oil and natural gas. On your terms,” said the President. He said that Russia has not made the decision yet. The President stressed that one should not search for some undercurrents in Belarus’ active actions aimed at pursuing a real multiple-vector policy. “Such is the time. If we don’t learn how to respond fast and adequately to challenges of the present, we will suffer as poor cousins in someone else’s backyard,” he said. “The Belarusian nation is a nation of working people. Maybe not in Russia but overseas, we will honestly earn our living. I am sure that Russian people understand and support us. Because we will never do anything that may harm the brotherly nation. It is impossible to destroy by any cliches that Russian mass media and sometimes politicians try to put on us,” concluded Alexander Lukashenko. “There will be no color revolutions, my dear. There won’t! As long as I am the president, these revolutions won’t happen! Nobody here is going to shoot their own people. Our people are not that stupid to go and storm something after getting money from abroad. People won’t do it and the situation does not exist. The situation will not exist even if we all start buying what we need from Russia at international prices,” said the head of state. He stressed that Belarus is “past the point when they could put us on our knees. Sometimes the Russian government thinks that we have no way out. There is a way! A country in the center of Europe will not be empty! But nobody will be allowed to bend us over or kick us! However emotional it may seem I am the president of the country, elected by the 10-million people, and they are not allowed to bend me over because it humiliates the nation when their president is on his knees before someone”. “We have lived through the financial and economic crisis. And today I must thank not the motherly Russia but who? The IMF, Europe, the West. It is they who gave us these billions so that our country would live. Why do you treat us like that?” wondered the President. “They have started talks that Kyrgyzstan serves as a signal to someone including to Belarus… It is ridiculous. There are fences neither around the government building, nor around the Presidential Administration or presidential residences. Have you noticed it? It is quite symbolic. It shows we are not expecting any color revolutions, we are not afraid of them,” the President said. According to the Belarusian leader, some mass media speculate that “Lukashenko makes such statements on Bakiyev because he is afraid”. “I am afraid of nothing. Whom should I be afraid of?” the Belarusian leader asked. “No shooting is possible here. You all know it,” he added. “I fight neither against Russia nor Europe or America. I want to fight none of them at all,” the President stressed. 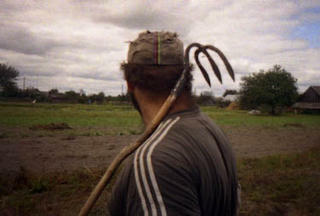 “The Belarusian people are a highly intellectual, talented and spiritual nation. Over the last years the world has learnt more about Belarus and the Belarusians thanks to the policy of integration in the global political and economic systems, sci-tech achievements, victories in sports competitions and art contests,” the President said. According to Alexander Lukashenko, efficient state institutions, competent staff and a high research and production level can secure a dynamic breakthrough in Belarus’ development. “New challenges require new solutions. To come up with them we need patience, hard work and complete dedication of everyone to the advantage of the whole society. These are the qualities of a patriot who proves by actions his love for Homeland,” the head of state said. 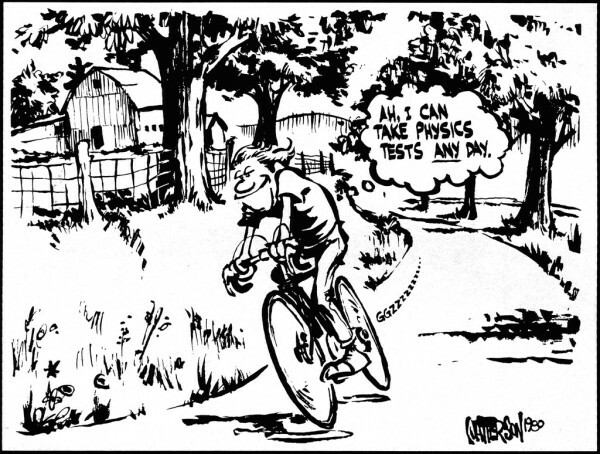 All government bodies, public associations and businesses have to take a test of their professional maturity. “We must not fail it. Our Belarus will grow richer and more prosperous, we will persistently advance if we unite for the future of our Homeland,” Alexander Lukashenko said. “The quality of production, the quality of management and the quality of life are the major underpinnings of our state. It determines the success of our hard work over these years. The Belarusian people support the national policy. It means we can confidently move ahead,” the President concluded. The legal framework of the CSTO allows its participants who act as international mediation to provide assistance to Kyrgyzstan, Sergei Maskevich, chairman of the commission for international affairs and links with the CIS of the House of Representatives of the Belarusian National Assembly, said in an interview with BelTA. “I believe that the CSTO and other international organizations set up by the former Soviet Union republics have the potential to perform stabilizing functions. On the other hand, there are no examples when such interference has proved efficient.” For the mediation to be a success, a high level of trust between the partners is needed, Sergei Maskevich is sure. Holding early presidential and parliamentary elections would be the best scenario for Kyrgyzstan now. “Unfortunately, this will not improve the economic situation. Yet it will bring certain political stability. And of course the elections should be observed by international organizations,” Sergei Maskevich said. The events in Kyrgyzstan teach a very important political lesson, Sergei Maskevich thinks. “Any revolution, any non-evolutionary change of power is fraught with unpredicted consequences. And no one even those who come to power with the help of such revolutions are safeguarded against them.” The worst thing is that they undermine the economy and wellbeing of people. “It is hard to imagine who would win from destabilizing the situation in the country bordering on Afghanistan, who is in a very complicated geopolitical situation. I think this is fraught with serious consequences for many,” the Belarusian MP said. Belarus and Venezuela are developing strategic partnership for the benefit of the two nations, Ambassador Extraordinary and Plenipotentiary of the Bolivarian Republic of Venezuela to Belarus Americo Diaz Nunez said at a ceremony of laying flowers at the memorial plate in the Simon Bolivar Park in Minsk on occasion of the 200th anniversary of Venezuela’s independence. The diplomat took note of the importance of developing all-round cooperation with Belarus. According to him, the cooperation has been especially vibrant after the visit of Belarus President Alexander Lukashenko to Caracas. According to the Ambassador, it was on 19 April 1810 that Caracas and six provinces of Venezuela annulled the mandate of the Captain General of Venezuela Vicente Emparan. This move became an important step towards official proclamation of Venezuela’s independence on 5 July 1811. According to Americo Diaz Nunez, Venezuela spearheaded the campaign for independence in Latin America in the 19th century. Today it also plays the leading role in the integration processes on the continent. The country is now defending its independence for the second time as its natural wealth has been plundered for 100 years by another empire. For the past decade Venezuela has achieved good results in recovering back its natural riches, first of all oil and minerals which are the basis for the economic development of the country. As Venezuela does not want to get dependent on oil, it has been working on promoting industrialization and diversifying its economy to get truly independent, the diplomat said. The Embassy of Venezuela is holding a series of events to mark the anniversary. A concert of the state academic symphony orchestra of Belarus conducted by Alexander Anisimov and Gerardo Estrada from Venezuela was held in the Belarusian philharmonic. The National Library is playing host to a Venezuelan exposition. An interesting program was prepared to celebrate the one-year anniversary of the Simon Bolivar Latin American Cultural Center in Minsk. On 23 April, BelAZ will demonstrate a new 360-tonne mining truck at the BelAZ (Belarusian Autoworks) test ground in Zhodino within the framework of research conference “Development prospects for open-pit transport”, BelTA learnt from the company. On the same day BelAZ will present other novelties including a 240-tonne mining dump truck and a prototype of a 136-tonne mining dump truck with long-distance control. The conference is timed to the 50th anniversary of Belarusian Autoworks’ design and experimental center. Attending the conference will be Belarusian and foreign technical experts from companies-suppliers, consumers, heads of research organizations. The participants of the conference will discuss the modernization and improvement of the production models and new samples of the mining machinery. They will sum up the tests of experimental samples of the BelAZ mining machinery in the CIS countries. The participants of the meeting will discuss the operating experience of the vehicles which have been designed recently. BelAZ specialists will meet with their customers who operate with Belarusian mining machinery. Founded in September 1948, Belarusian Autoworks mainly offers rock haulers, frontal wheel loaders and bulldozers, tow trucks, special vehicles for underground operations, heavy payload trucks for metallurgy industry and other specialized technological vehicles. Belarusian Autoworks occupies one third of the world’s rock haulers market and is one of the world’s seven largest manufacturers of quarry vehicles along with Komatsu-Dresser, Euclid-Hitachi, Caterpillar, Liebherr, Terex, and Kress. In January-February 2010 the trade turnover between the Grodno oblast and the Republic of Armenia totaled $184,600 (up 25.3% on the same period 2009), said acting chairman of the Grodno oblast executive committee Ivan Zhuk at a meeting of Grodno officials with a delegation of the Shirak province of Armenia on 19 April. The Grodno oblast exports dairy products and packaging to Armenia. In 2010 the Grodno oblast started supplies of agricultural machinery and mechanical devices to Armenia. Armenia did not export anything to the Grodno oblast in 2010. Lidselmash exports potato diggers, potato planters, sowing machines, and fertilizer spreading units. Lida Dairy delivers full cram milk powder and butter. The KonteSpa company delivered $42,200 worth of hosiery goods to Armenia in January-February 2010. The sides are mulling over the deliveries of the Lidaagroprommash grain harvesters and the Neman buses to Armenia. The sides expressed their confidence in the expansion of bilateral cooperation. Lida Nanyan, Governor of the Shirak province, said that Armenia wants to develop cooperation with the Grodno oblast in agriculture, industry, economy, education, healthcare and culture. Grodno and Gyumri are likely to establish twin city relations. KYRGYZSTAN'S interim leader Roza Otunbayeva has condemned Belarus' decision to take in ousted Kyrgyz president Kurmanbek Bakiyev, warning that Bishkek would appeal to Interpol if he is not extradited. 'Kyrgyzstan's people may not react positively to Belarus taking in such a man that has the lives of many people on his conscience,' Ms Otumbayeva told reporters late on Tuesday. 'Anyone who suffered from him thinks that there can be no refuge anywhere in the world for this sadist,' she added. 'This criminal must be handed over back to our country. If that does not happen, there is Interpol,' Ms Otumbayeva added. Belarusian President Alexander Lukashenko confirmed on Tuesday that Mr Bakiyev was in Belarus, ending days of uncertainty over the toppled leader's whereabouts. 'Mr Bakiyev and his family, four people in all, have been in Minsk since Monday evening, as guests,' Mr Lukashenko said during an address to the Belarusian parliament. U.S. prosecutors have charged a Belarusian man with operating a Web site designed to help identity thieves use stolen financial data, including credit card numbers. Dmitry M. Naskovets, the creator and operator of CallService.biz, was indicted Monday on charges of conspiracy to commit wire fraud, conspiracy to commit credit card fraud and aggravated identity theft. He was arrested by Czech Republic authorities on Thursday. U.S. prosecutors are seeking his extradition. Prosecutors from the U.S. Attorney's office in Manhattan alleged Nashkovets and another man designed CallService.biz to counteract security measures put in place by financial institutions. His coconspirator has been arrested by Belarus authorities, U.S. prosecutors said. The Web site allegedly provided English- and German-speaking individuals to persons who had stolen account information in order to beat bank screening processes requiring vocal verification for some transactions. 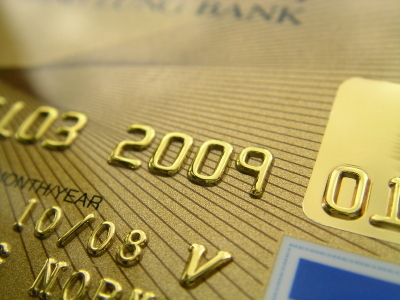 Prosecutors said the Web site was used by more than 2,000 identity thieves in more than 5,000 instances of fraud. Belarusian President Alexander Lukashenko said on Tuesday that Russia's actions were undermining the foundations of the Customs Union. "The Russian leadership has in recent years decidedly embarked on a policy of pragmatism, on so-called market relations," Lukashenko said in an address to parliament and the nation. The president said that Belarusian products were being squeezed out of the Russian market, creating obstacles to their transit to Asian countries. The president also said higher energy prices were one way Belarus was being squeezed from the Russian market, complaining that oil prices were twice what they used to be, making it unprofitable to sell petrochemicals. Relations between Moscow and Minsk have been soured by a series of economic disputes, including over Russian energy supplies. Earlier this year the two ex-Soviet neighbors were involved in a dispute over oil supplies, as Moscow demanded Minsk pay full import duties on crude it refines and resells to Europe, dropping considerable subsidies. Lukashenko also said that the Customs Union of Belarus, Russia and Kazakhstan would only be workable if the sides meet all their commitments and obligations. Belarus and Ukraine are showing signs of a recovery from the global financial meltdown, the latest data suggests. "The country has exited the recession - this is the evaluation of the World Bank and the IMF" - Belarusian President Alexander Lukashenko said in a message to parliament and the nation. According to Lukashenko, GDP growth in the first quarter was about 5% higher than in the same period last year. The National Statistics Committee of Belarus said however that growth was about 4 %. "The main aim of this year is to reach 11% GDP growth and we are confident that we will achieve this," Lukashenko said. The situation with Ukraine is however more complex. The chief consultant of Ukraine's National Bank, Valeriy Lytvytskiy, said that three branches of the real sector of the economy had been able to move out of recession in the first quarter of 2010, demonstrating an aggregate growth of 38% of GDP (10% in industry, 5.3% in agriculture and transport more than 16%). At the same time, the situation was discouraging in the construction sector and trade, which registered a decline of 24% and 3.1%, respectively, in the first three months of the year. Moreover, of special concern was the situation in capital investment, which declined more than 21% in the reporting period. With which wife has Bakiyev arrived to Minsk? Kurmanbek Bakiyev, the ousted dictator of Kyrgyzstan, has two inofficial wives beside the official one, and children with them. Answering questions of "deputies" of the "national assembly" on April 20, Alyaksandr Lukashenka said that since Monday the ousted presdent of Kyrgyzstan Kurmanbek Bakiyev and family are in Belarus. He mentioned 5-year-old son and 9-year-old daughter of Bakiyev. However officially Bakiyev has only one wife, Tatyana Bakiyeva, who was born in Samara and is a production engineer by education. They have 2 grown-up sons, one of whom Bakiyev was believed to be preparing as his successor. Where could the children mentionaed by Lukashenka come from? According to Kyrgyz workers of "Radio Liberty", rumours about Bakiyev's other family apperaed long ago, but in early March it became an issue of rpublic discussion for the first time. In March the former State Property Minister Ravshan Dzhaimbekov who lives in the US now, addressed Bakiyev with an open letter, calling upn the president not to violate moral standards. It was stated in the letter that beside the official wife, Bakiyev had two inofficial ones. The party "Erkindik Kyrgyzstan" states that the provisional government has given "guarantees of inviolability to the president, his minor children and wifes". 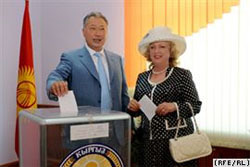 Vice President of Kyrgyzstan in the provisional government Azenbek Bagnazarov stated at a press-conference that Bakiyev has fled the country "with his third, inofficial wife". On 7 April Maryna Yauseichyk, student of the Journalism Faculty of the Belarusian State University, received a phone call from an unknown person, presenting himself as a KGB officer Zmitser, who invited the girl for conversation to the KGB office at 6a Kazlou Street in Minsk. The conversation was to deal with the 3 July 2008 Minsk explosion. The student received another call from the same person, who inquired whether she was going to turn up. As a result, the girl was forced to agree to come. ‘At first, he did ask me about the explosion. However, then he changed the subject, and started asking me about various parties and youth movements, whether I participated in any events or rallies. I said I did not take part in any events. Then he asked me about the creative intellectuals, whether I had met them or taken part in any of their meetings and taken notes of their speeches. Then he took out a laptop and showed me a video of the World Association of Belarusians "Backaušcyna" congress and asked me what I were doing there and why I had taken notes if I was not member of the organization. I did work as a secretary at the Congress and told him I had done this voluntarily. He also showed me copies of newspaper and Internet articles and inquired whether I had anything to do with them, accusing me of discrediting Belarus. He showed me the respective article of the Criminal Code. To threaten me, he said I was in trouble and promised to ‘forget’ about various facts, including my participation in the Congress and collaboration with the web-site (www.represii-by.info) and promised that I would not be expelled from the University. But only in case if I agree to cooperate with them. He suggested that I continued collaborating for the site, kept an eye on the people I have contacts with and report on all that. The early voting period in Belarus' elections for local soviets began on April 20. The polling stations will be open from 10:00 a.m. to 7:00 p.m. with a break in the afternoon during the five-day period. Voters are required to produce their passports to cast ballots. Other documents that entitle people to vote early include the pension certificate, student identification card, military card (for military servicemen), certificate of employment (for civil servants) and a residence document (for Russian citizens living permanently in Belarus). In the previous local elections held in 2007, 25 percent of all registered voters cast their ballots during the early voting period, Mikalay Lazavik, secretary of the central election commission, told BelaPAN. The percentage is expected to be smaller this year, he said. Mr. Lazavik said the central election commission had given “appropriate recommendations” at special seminars held earlier for local authorities responsible for the conduct of elections. If the recommendations are fulfilled, the turnout may be lower, he said. He pointed out, the number of people who will vote early in this week's elections for local soviets may be smaller than in the previous, January 2007 local elections. Much attention should be paid to early voting in cities, Mr. Lazavik said. "Cities have many mobile citizens, including students who go out of town to visit their parents, and also workers and retirees who may go away to their summer houses. That is why not only explanatory but also organizational work is necessary in cities to help people who wish to cast their ballots before April 25." In rural areas, on the other hand, it makes no sense "to speed up the voting process," Mr. Lazavik said. "People there are unlikely to be away from home on Sunday," he explained. "They will be very happy to come to their polling stations on April 25 to feel the festive atmosphere and be entertained." If recommendations given by the central election commission to election organizers during a recent workshop are implemented, the early voting turnout may be lower this time compared with the previous local elections, he said. According to the central election commission, nearly 25 percent of all eligible voters cast their ballots during the early voting period in the 2007 local elections, with the total voter turnout reported at 79 percent. Uzbek President Islam Karimov expressed solidarity with Russia on April 20, setting aside disputes that have strained relations between Moscow and Tashkent to stress the two countries’ shared concern about instability in Kyrgyzstan. Analysts say the ongoing unrest in Kyrgyzstan has the potential to threaten Karimov’s regime. "Our viewpoints coincided completely," Karimov said after talks with Russian President Dmitry Medvedev during his first visit to Russia in more than two years. "What is going on today in Kyrgyzstan is in nobody’s interests -- and above all, it is not in the interests of countries bordering Kyrgyzstan -- and there is a fairly serious risk that these processes will acquire a permanent character." Speaking at the start of his talks with Karimov, Medvedev said: "Clearly, both Russia and Uzbekistan are interested in having the authorities in Kyrgyzstan be strong and having the people of Kyrgyzstan develop and prosper." The provisional government in Kyrgyzstan, which swept to power April 7 amid the collapse of Kurmanbek Bakiyev’s administration, has so far been unable to assert full control over the country. A pogrom in a Bishkek suburb on April 19 that left five dead underscored the new leadership’s lack of control over developments. [For background see the Eurasia Insight archive]. If the Kyrgyz unrest spins out of control, it could undermine Karimov, the 72-year-old strongman who has ruled Uzbekistan for the past two decades, analysts said. Uzbekistan and Russia "are identically interested in avoiding the worst-case scenario in Kyrgyzstan," said Andrei Grozin, head of the Central Asia department at the Institute of CIS Countries in Moscow. Instability in southern Kyrgyzstan, where supporters of Bakiyev have challenged the provisional government, could easily spill across the porous border into Uzbekistan, Grozin said. The analyst noted that the last popular uprising that ousted a president of Kyrgyzstan -- the Tulip Revolution of 2005 -- was followed just weeks later by mass protests in Andijan, Uzbekistan, the biggest show of opposition to Karimov’s rule during his two decades in power. That protest was violently suppressed by Uzbek authorities with a large loss of life. [For background see the Eurasia Insight archive]. Karimov’s regime is also worried about the riots that have roiled Bishkek in recent days. The unrest is fuelled mainly by poverty and could set a precedent for Uzbekistan, said Ana Jelenkovic, a London-based analyst for the Eurasia Group consulting firm. "These are not anti-government protests: they stem from frustration with poverty, the state of the economy and quality of living. All of those issues exist (and are worse) in Uzbekistan than in Kyrgyzstan," Jelenkovic said. Though Karimov’s security forces would likely deal swiftly and more resolutely with any similar uprisings in Uzbekistan, "the concern is real and certainly it is in Karimov’s interests to align with Russia on this," she added. Karimov’s visit to Moscow, which also included talks with Russian Prime Minister Vladimir Putin, has been widely seen as an effort to mend strained relations between Russia and Uzbekistan. Last summer, Karimov boycotted a summit in Moscow of the Collective Treaty Security Organization and refused to support the creation of a CSTO rapid-reaction force, a pet project of the Kremlin as it seeks to build up the CSTO -- a loose grouping of former Soviet republics -- into an alliance that can serve as a Russian-dominated counterweight to NATO. Karimov’s boycott came after Uzbekistan fiercely objected to Russian plans to establish a new military base in southern Kyrgyzstan. [For background see the Eurasia Insight archive]. The Uzbek government has raised eyebrows in Moscow by flirting with the United States in recent months. Tashkent has hosted a series of visits by top US generals and diplomats, believed to be aimed at securing greater cooperation on Afghanistan. Uzbek authorities also angered Russia by demolishing a Soviet-era war monument in Tashkent in November, a move that led pro-Kremlin youth groups to protest outside the Uzbek Embassy in Moscow. [For background see the Eurasia Insight archive]. Analysts cautioned against reading too much into Karimov’s shift to a more pro-Moscow stance, calling it a step in Uzbekistan’s long-standing policy of playing Russia, the United States and China off against each other. "The pendulum swung too far to the West, and now Karimov has returned to the tactic of being closer to Russia. At least until the next readjustment, he will show a little more warmth to Moscow, and a little less of the whole-hearted embrace of the West," Grozin said. "The situation in Kyrgyzstan has brought a certain correction to Karimov’s policies." Russia's children rights ombudsman Pavel Astakhov speaks during his news conference in Moscow Monday, April 19, 2010. Astakhov said Monday all adoptions to the United States will remain suspended for a couple of months until Russia and the United States to sign a bilateral deal on adoptions. All Russian adoptions to the United States will remain suspended until a new agreement is negotiated, which could take up to two months, the Kremlin's children's rights ombudsman said Monday. Russia froze U.S. adoptions last week after a boy was put on a plane back to Russia by his adoptive American mother. The woman said she "no longer wishes to parent" Artyom Savelyev, who had just turned 8. Talks on a new adoption agreement were supposed to have begun Monday but were postponed until next week after the volcanic ash prevented the U.S. delegation from flying to Moscow, the U.S. Embassy said in a statement. Pavel Astakhov, the ombudsman, predicted an agreement would be signed within a couple of months. "While we are working on the agreement, adoptions will be frozen," he told reporters. The circumstances of the freeze remained unclear. The Education and Science Ministry, which overseas international adoptions, said Monday that it still had not received official notification. The United States also has received no notification, but "it appears that the recent controversy has slowed the process down," the embassy statement said. Astakhov declined to answer questions about who ordered the suspension of U.S. adoptions and when, saying no documents would be made public before Russia showed them to the U.S. delegation. The freeze was announced Thursday by the Foreign Ministry spokesman in his weekly televised briefing. The ministry refused last week to provide further information, and a statement issued Monday did little to clarify the situation. The ministry statement said the dispute could only be resolved through the signing of a bilateral agreement providing for greater monitoring and control over U.S. adoptions. "If our partners show a willingness to sign such an agreement, this will help avoid a freeze of adoptions to the United States," it said. "So far the United States is not showing any interest in securing such an agreement." 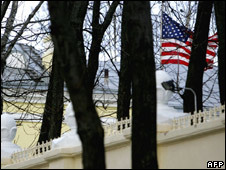 Astakhov, however, said U.S. officials had shown a willingness to negotiate such an agreement. The ombudsman also said that Artyom, the boy whose return led to the freeze, was expected Monday to leave the hospital where he has been undergoing medical checks since arriving in Russia on April 8. He will be placed in a foster family, most likely with the English-speaking family of a Russian diplomat, Astakhov said. He gave no further details. More than 1,800 children from Russia were adopted in the United States last year, according to the Education and Science Ministry. The ousted leader of Kyrgyzstan says from exile in Belarus that he is still president of his Central Asian country. Kurmanbek Bakiyev was deposed in an April 7 uprising that left 85 people dead in the Kyrgyz capital and then fled last week to neighboring Kazakhstan. He arrived in the Belarusian capital earlier this week. In his first comments from exile Bakiyev was defiant and said he has not resigned. He told reporters Wednesday in Minsk that he is still "the legitimate president of Kyrgyzstan," and described the interim government controlling Bishkek as "a gang of impostors." Hundreds of supporters of Kyrgyzstan's interim government clashed Wednesday with followers of the deposed president, as authorities struggle to restore order two weeks after a bloody revolt in the Central Asian nation. Witnesses told The Associated Press that scuffles broke out between provisional government supporters and supporters of ousted President Kurmanbek Bakiyev in Jalal-Abad's central square. Jalal-Abad, in Kyrgyzstan's south, is one of the few remaining towns where support for the toppled leader is still visible. Bakiyev is being sheltered by Belarus. Kyrgyz officials plan to seek his extradition to answer for the deaths of at least 85 people during the uprising. The shaky interim coalition, which is set to run the former Soviet country for six months, is struggling to restore stability. The efforts are being watched with concern by Russia and the United States, both of which have military bases there. Belarus' authoritarian President Alexander Lukashenko said Tuesday that Bakiyev and his family are under his personal protection. Bakiyev arrived in Belarus earlier this week after fleeing Kyrgyzstan initially for neighboring Kazakhstan in an internationally brokered arrangement. The incidence of business use of illegal computer software increased in 2009, but the penalties incurred decreased. While 281 businesses were caught out last year – 6.5 percent more than in 2008 – fines totaled only zl.821,000. According to the Business Software Alliance (BSA), an organization of the world’s largest software companies, Polish firms were turning to pirate software in an attempt to cut costs during the economic downturn of 2009. “A significant outbreak was noticed in the first half of the year,” BSA Poland coordinator Bart?omiej Witucki said. He said this spike paralleled increased retrenchment rates and that the recently unemployed were informing on their former employers. But the increased number of revealed cases did not coincide with the size of fines issued. Total penalties were 41 percent less than in 2008. Of z?.821,000, compensation cost zl.747,000 and legitimate software cost zl.74,000. That compares to zl.1.4 million in penalties in 2008, of which zl.1.2 million was spent on compensation and the rest was spent on acquiring legal programming. BSA research shows that in 2008 illegal programming was installed on as many as 56 percent of Polish computers – only one percentage point less than in 2007. That is equivalent to losses to software companies in the amount of $648 million. Statistics for 2009 will be revealed mid-May. A lumberjack narrowly escaped a fatal end with his chainsaw while climbing a tree. Tomas Majerczyka, 22, was trimming branches in the forest near his house in Szczawnica when the incident took place. While climbing a tree, he slipped from a branch and tumbled to the ground, the chainsaw landing on his neck. “It’s a miracle that he is alive. He will be in hospital for some time but his condition seems stable,” said Przemyslaw Maslowski, head surgeon at the hospital. The Swedish neo-Nazi who ordered the theft of the famous ‘Arbeit Macht Frei’ sign is to be extradited to Poland to face charges this week. According to reports, Anders Hogstrom had been commissioned by a British collector of Nazi memorabilia to obtain the sign, though this has yet to be confirmed. “According to the law, the Polish authorities have 10 days to come and get him, so April 10 is the last day they can come and get him. We will keep him here in Stockholm until they come. But I can confirm that he’s still here,” she added. Jack Campbell stopped 30 shots to lead the U.S. to a 5-0 victory over Canada at the under-18 hockey world championships on Friday. Bryan Rust and Jason Zucker each had two goals for the U.S. and Austin Watson added a score. The Americans improved to 2-1 in group play. They have a day off before playing host Belarus. Calvin Pickard made 33 saves for Canada (1-2), which wraps up round robin play against unbeaten Sweden on Sunday. More than160 works will be presented at the 3rd Minsk International Exhibition of Graphic Arts Art-Line which will open in the Belarus National Library on 20 April, BelTA learnt from the library. Graphic works created by artists from Belarus, Russia, Ukraine, Latvia, Lithuania, Estonia, Slovenia, Bulgaria, Spain and other countries will be displayed in three galleries of the library: Rakurs, Labirint and Atrium. A contest of the works will be held within the framework of the exhibition. The jury panel will present winners of the contest with special diplomas. According to organizers of the forum, the Art-Line Exhibition will demonstrate new prospects of the graphic arts, its potential, its capability to renovate, the possibility for search and experiments, the place of the graphic art in the creative activity of European artists, promote creative contacts. The Art-Line Exhibition also includes the special retro-program which will present lithographs created by British artist and architect Joseph Nash (1809-1878). 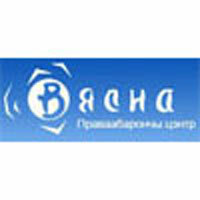 The exposition composed of 42 works will become the first presentation of the graphic stocks of the Belarus National Library. The exhibition will be running through 11 June. Belarus is still in favor of a comprehensive rapprochement with the United States, President of Belarus Alexander Lukashenko said in his annual State of the Nation Address on 20 April, BelTA has learnt. “It is in the interests of both Minsk and Washington. We have enough areas to develop mutually beneficial cooperation and areas of common interests. We offer the Barack Obama administration, the first steps of which were encouraging, to enter a comprehensive partnership. We are keen on constructive cooperation,” the Belarusian leader said. “The contacts with US representatives, including a meeting with a delegation of the US Congress, are a testimony to the mutual interest of the parties. However, a civilized, truly efficient dialogue is hardly possible when one of the parties is openly pressurized. It is good that US business people, first of all, are aware of that. Top executives of a number of US companies said this during my recent meeting with them. By the way, nothing frightens or discourages them about our country,” the President said. The Belarusian leader reiterated that it was discriminating on part of Washington not to invite Belarus to the Nuclear Security Summit because “we did not dance to the tune of the United States and Russia”. “They told us to give away highly enriched uranium. I said, I do not give away anything – it is not mine, it is the property of the nation, under the control of the IAEA from who we do not hide anything. In addition, as far as I understand it, Russia reassures the US: don’t worry, we will take away the uranium from Belarus. I should say, neither Russia nor anyone else can do that without our consent. We are ready to embark on negotiations. It is not about money, oil or gas. We are a nation, and what we have is ours,” the Belarusian leader said. Belarus is ready for the most sincere talk with the European Union about every thing Belarus’ partners may be interested in. President of Belarus Alexander Lukashenko made the relevant statement in his address to the Belarusian nation and the parliament on 20 April, BelTA has learned. Alexander Lukashenko remarked that Belarus has never tried to hide its interest in more vigorous and comprehensive rapprochement with Europe. “It is our second largest trade partner and our key trade partners as far as some commodities are concerned. In addition, we have several serious problems and issues, which have been on hold for a long time. Our nations are looking forward to their resolution. The facilitation of visa regulations between our country and the European Union is the most vital one. We would like the Belarusians to avoid artificial barriers and formalities as they cross the border,” he said. Belarus welcomes the European Union’s Eastern Partnership Initiative, which is meant to enable large-scale involvement of several countries, including Belarus, in common European processes, added the President. “Our relations in this project cannot be but those of equals. Without imposing any development model or cooperation format on us. Not like they are trying to do in the Eastern Partnership’s parliamentary dimension EuroNest. In EuroNest you, parliamentarians, should represent Belarus. The nation has elected you and it will not understand or support any other decision. Why do only we have to meet these requirements? There are other partner nations with the same problems we have. Why is Belarus singled out? If we don’t fit into the Eastern Partnership, tell us about it. Moreover, we have not received anything from it and will unlikely ever receive,” said Alexander Lukashenko. Further development of political and foreign trade ties with such neighboring nations like Poland and the Baltic states will remain a priority of Belarus’ foreign policy. The head of state also remarked that long-term cooperation with Ukraine meets Belarus’ strategic interests. “The similar geopolitical position, the economy structure make the country our natural ally in several sensitive matters. This is why it is necessary to build a system of deep and comprehensive cooperation with the southern neighbor. The system was formed during top level meetings that have taken place recently,” he stressed. “I am convinced that if we are united, our opinion will be heard sooner both in the West and the East,” added Alexander Lukashenko.